Eating – it’s something we have to do to survive and yet it often becomes so complicated. I remember when I started teaching yoga in the evenings around dinner time. I struggled with “When do I eat? Before yoga and risk feeling too full and uncomfortable in the poses? After yoga when I’m tired and just want to go to sleep?” My clients often struggle with when to eat as their busy daily schedule doesn’t always permit them to eat when they are hungry. When should I eat if I can’t eat when I’m hungry? The complexity of food timing often means that we eat when we are, in fact, NOT hungry. As mindful & intuitive eating practices become more well-known and accepted, I fear the term “emotional eating” has become villainized. Intuitive eating encourages us to honor our hunger with food and honor our feelings without food. These are fantastic guidelines and, when possible, are quite beneficial in breaking a restrict/binge cycle. Lately, however, I find myself cringing when I hear or read about the faultiness of emotional eating & and the rewards of mindful & intuitive eating. Often the promise is still steeped in the diet mentality. It reads something like this: If you follow this “wellness program” you will feel better and “may” lose weight (but of course that’s not the goal because we don’t promote weight loss because we are a wellness program). Ah, sneaky sneaky. The complexity of knowing when & why to eat only became more apparent for me when I had my baby girl, Kassidy (now 11 months!). She is a strictly breast-fed baby (refused to take a bottle) and she seemed to nurse 24/7 for the first 3 months. The more I reached out to moms in real life, (not the internet) I discovered I wasn’t alone – most newborns nurse nearly constantly. But she can’t possibly be hungry ALL THE TIME?! As a new mom, I was now responsible for not only figuring out if I was hungry and when to eat, but now I had to figure out if my baby was hungry and when to feed her. I soon realized how completely defenseless this baby was and that I held all the power. If I deemed that she couldn’t possibly be hungry because she just ate, I would fight to find other ways to soothe, comfort, love and connect with her. Sometimes it worked. Sometimes she kept crying for what felt like hours (but was probably 10 minutes) until I nursed her. She was doing the unthinkable, the forbidden – emotionally eating. 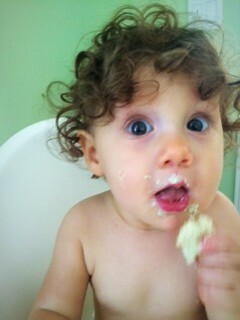 My baby spent nearly the first 8 months of her life emotionally eating. Of course, she was receiving necessary calories for growth, but most of the time she wanted the comfort, love, support and connection that accompanied nursing. (I strongly believe bottle fed babies have the same emotional attachment, but I don’t have personal experience). There are certainly “experts” who would argue that after 3 months (or even younger) that a baby should only eat for nutrients, but I think most would agree that a baby needing food for comfort is “normal” and “acceptable”. I can’t help but wonder then, why is it okay for food to also provide love, soothing, comfort and connection in addition to nutrition when we are babies, but not as we get older? Why is emotional eating getting such a bad rap? The message we get from an early age is that it’s bad to eat for reasons other than hunger. When we “catch” ourselves emotionally eating, we are ashamed so we numb out and typically eat more than we would have to begin with because the guilt is overwhelming. What if emotional eating could ALSO be mindful and intuitive? What if we didn’t have to choose between being emotional, mindful or intuitive? 1) HONOR YOUR EMOTIONAL AND PHYSICAL HUNGER – Sometimes we aren’t physically hungry, but we still want food. Sometimes we are able to recognize that we are bored, so we engage in an activity or we are tired, so we sleep. BUT sometimes even when we aren’t physically hunger, we still really want to eat. If you aren’t physically hungry, but you want to eat, can you stay in the present moment and identify what it is that you are feeling without judgement? 2) ONCE YOU’VE IDENTIFIED WHAT YOU ARE FEELING, STAY HONEST WITH YOURSELF – Perhaps you are able to identify that you feel frustrated and you want to eat pretzels. You know you aren’t physically hungry for pretzels, but you still really want pretzels. Instead of denying yourself pretzels, give yourself full permission to eat the pretzels because you are frustrated. You may even say out loud “I am eating pretzels because I am feeling frustrated” or “I feel frustrated, I want pretzels”. This is so important because you aren’t checking out, numbing out, or using food as a weapon. You are staying present with what you are feeling and being intentional in your choice to eat. Stay connected to the part of you that is needing something. If you are eating brownies because you are sad and need to feel loved – stay connected to the part of you that needs to feel loved and acknowledge it fully. 3) CONTINUE TO OFFER YOURSELF PERMISSION, COMPASSION AND ACCEPTANCE – Remind yourself that eating while NOT hungry is okay. Eating isn’t destructive – denying that you are eating and denying your feelings is destructive. You deserve love, compassion and acceptance. You have permission to eat whatever you want without fear. Sometimes a bubble bath, a hug, a walk, a call to a friend is exactly what we need when we are experiencing difficult emotions. But the honest truth is sometimes the answer is food. Notice when you give yourself permission to have whatever you want, if it’s easier to stay present with what you are feeling – whatever you are feeling in that moment. Continue to offer yourself compassion and acceptance, and you may find you are free from shame and guilt, thus allowing yourself to avoid a binge/restrict cycle. Eating is complex. Eating is complicated. Eating is messy. But it is also joyful, pleasurable, fun, soothing, comforting & nourishing for the body and soul. There isn’t a right or a wrong way to eat. Eating isn’t a punishment nor is it punishable. Our relationships to food are emotional – let’s not pretend that they aren’t and then be surprised when we eat for comfort. You are an emotional being – there will be times when you eat for some reason other than hunger. Practice patience, kindness and acceptance and you will find exactly what you are hungering for physically, emotionally, mentally and spiritually. PS I am currently offering a free BodyWisdom Coaching Session. Contact me to set up your free session – sessions are done over the phone so you can live anywhere!